1950 Racal formed as two-man consultancy by Raymond Brown and Calder Cunningham in North London. 1954 Racal moved headquarters to Bracknell, Berkshire. product, began an initial 20,000 production run. 1958 Death of Calder Cunningham. Government to become Head of Defence Sales at Ministry of Defence. Mr. (now Sir Ernest) Harrison elected Chairman & Chief Executive of Racal Electronics. ‘Squadcal’, Racal's first tactical military manpack radio, entered production. Limited, based in UK, with the Milgo Electronic Corporation, USA. Pre-tax profits of Racal exceeded £1 million for the first time. 1977 Milgo Electronic Corporation of Florida acquired for £37 million. 1980 Decca (capital goods) acquired for £106 million. Data communications turnover exceeded £100 million for the first time. 1981 Radio communications turnover exceeded £100 million for the first time. 1982 Pre-tax profits of Racal exceeded £100 million for the first time. portable and mobile public telephone service based on cellular technology. the Racal Security group amounted to £356 million to become the largest activity within Racal. 1985 Racal-Vodafone opened Britain's first commercial cellular telephone service. Total annual sales by Racal exceed £1 billion for the first time. 1988 Vodafone became the world's largest and most profitable cellular radio network. public company, in which Racal Electronics Plc retained an 80 per cent holding. Wormald Security of Australia, bought for £60 million. the Department of Social Security. shareholders, becomes Vodafone Group Plc. Racal wins its largest ever single radio contract valued at £70 million. 1992 D C Elsbury OBE, promoted to position of Chief Executive. shareholders, becomes Chubb Security Plc. Racal awarded its first commercial contract for a data network service. and sold the first tickets on 14 November. Racal awarded a Public Telecommunications Operator (PTO) licence. Sensors division of Thorn EMI Electronics acquired for £18.9 million. BR Telecommunications Ltd. acquired for £132.75 million. Racal awarded an international telecommunications operators licence. 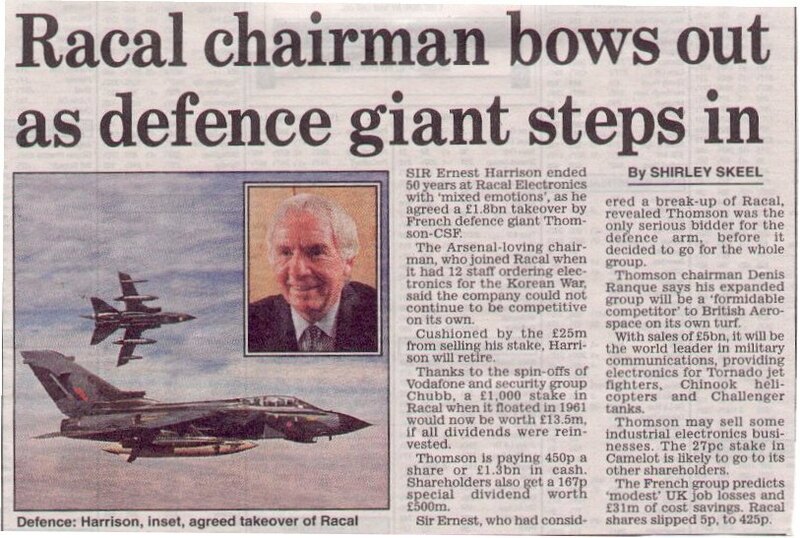 1997 Formation of Archer joint venture to supply the Ministry of Defence ‘Bowman’ programme. by French defence giant Thomson-CSF. The new group becomes know as Thales.